Several city council members in an Alaska town refused to attend a meeting where the mayor was scheduled to deliver a Pride proclamation, which ended up canceling the meeting for lack of a quorum. Bryan Zak, mayor of Homer, Alaska, was supposed to deliver a statement in support of Pride Month at Monday’s regularly scheduled city council meeting. The city council said that it received numerous emails about the proclamation: 63 for it and 112 against it. Many of the emails were sent through a form on Alaska Right to Life’s website and did not come from the remote town’s of 5000 residents. On Monday afternoon, three city council members – Heath Smith, Shelly Erickson, and Tom Stroozas – told the city clerk that they would not be attending the meeting. The city council’s rules require four of its six members to be present for quorum, so the meeting was canceled. Zak still read his proclamation in the Homer City Hall parking lot to about 75 people who attended. “I, Bryan Zak, Mayor of Homer, recognize June 2018 as ‘Homer Pride Month’ and encourage the Homer community to join in celebrating the diversity within the City of Homer,” the proclamation said. Right before he spoke, a silver pickup truck drove by and the driver shouted “Shame on you, Bryan,” before driving off. “I’m just happy that we were able to provide the (recognition) in a timely manner,” Zac told the Homer News. 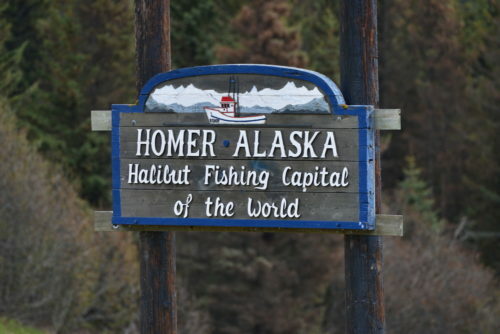 Homer’s Pride parade is scheduled for June 23, so waiting for the next meeting would have been too late. In an email explaining his absence, Smith said that he was worried that the Pride Month proclamation would lead to animosity, comparing it to a proposed resolution last year that declared support for immigrants. “I did not attend that meeting because I did not want to subject this community to any semblance of what happened the last go around,” Smith said. Stroozas said he was trying to prevent controversy in the city’s politics. “I didn’t feel like the city should subject itself to a possible confrontation in the council chambers, and that’s what I was trying to prevent,” he said. Erickson claimed that she received so many phone calls against the proclamation that she had to get teeth capped because she was clenching her teeth so much from the stress. “Why take something like gay rights and make it so divisive instead of bringing people together in a positive way?” she said. She did not say why she believes the mayor’s proclamation is “divisive,” other than that it supports LGBTQ rights. Council member Rachel Lord, though, said she was “deeply disappointed” that her colleagues boycotted the meeting, citing the work that went into preparing the meeting.